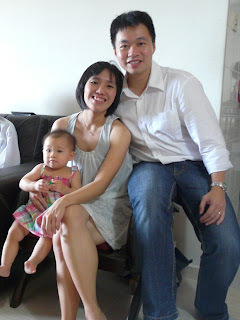 Taken before we left for dinner...Eliza was already very tired cos she missed her afternoon nap. 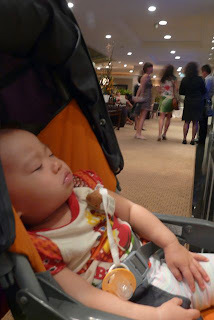 Yup so she slept while we waited for to go eat at 830pm. Food was fantastic and we were super full by the sixth dish that we requested the last two dishes, to be dabao-ed. More words another time...i'm sooooo tired..took 2 naps today and still tired..and my tummy's making weird noises..i wonder why. I went out yesterday with my mil & Eliza. Actually, it was Eliza who was the happiest..i think she's the one who's suffering from being stuck at home..not me. 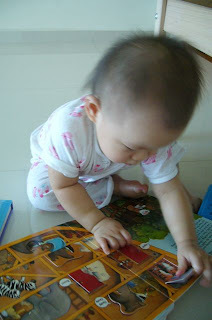 She was babbling & squealing away at NTUC, then at Popular i could hear her in delight cos my mil gave her a book. One of the mornings, she woke up and rolled out of bed to play with her toys. I was asking her to give me her pacifier cos she's not sleeping already, which she'll do cos it's our morning protocol. Yesterday she we were changing bedsheets, which she thoroughly enjoys as she'll roll all over the bed, climb here and there, move the pillows and bolsters etc. Suddenly the room was spacious cos the mattresses we pushed up so the floors can be cleaned...so she's just enjoying walking around and doing her arms up thingy. funny. haa.. Anything new and playable becomes her toy so that she can give us some peace time. 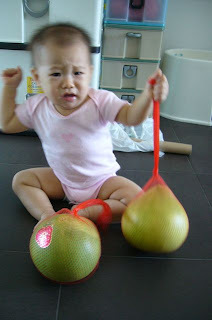 well..she gets over ambitious most of the time..she wanted to carry two pomelos, one is already so heavy! 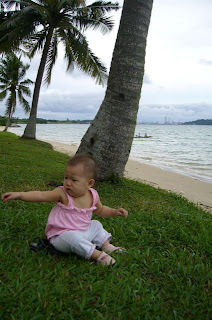 Ever since i was back from hospital, Eliza has been practicing a lot of walking. It's quite funny to see her waddle back and forth, pick things up and walk else where. Really fun to see her enjoy her new skill so much. It's a new phase now that she's walking more confidently...next is to see her run & jump! It has been such a joy watching her and taking care of her. Doing things consistently really helps. ~She will guai guai lie down to let you change diapers for her, even if she's complainy about it she'll still lie down and complain but at least she'll stay still. ~ when it's time to wash her backside cos she pooped she'll lean on our lap and let you wash her clean. if she has done her poop and you've brought it to her attention, she'll pull her shirt to kinda tell you that she has to change..not her shirt but i guess to mean change-time! 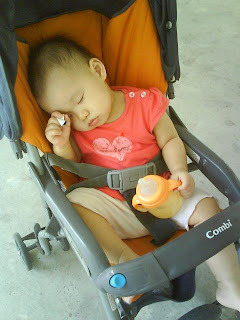 ~ She'll guai guai give me her pacifier after she wakes up cos i always tell her that if she's not sleeping, no pacifier. ~ She'll generally obey some commands, ie not to touch the ipod at my bedside, not to touch the power socket..even though she'll try. How to rest at home? Honestly, i'm quite bad at that. 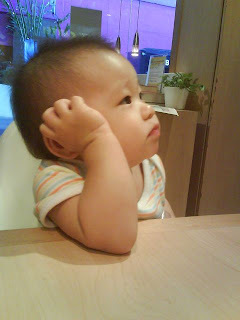 I'll try to help around the house and watching 2 hours of sitcom in the day makes me guilty. 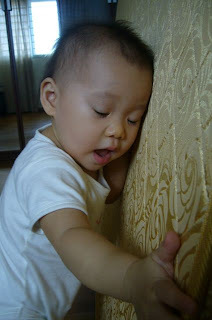 I can't go out of the house either cos i recently realized i can't walk a lot without feeling quite tired after that. I overestimated myself and walked to TM on sunday for breakfast and walked back again. That's about 20min walk there. And Ww was looking for his shower gel after bfast but most shops weren't open so we walked another 15mins around TM basement waiting for the shops to open to look for his shower gel. At one point i was already feeling quite tired out i complained i wanted to go home and didn't care whether he gets his shower gel or not. On and off i'll have tired spells, usually in the morning, maybe cos i get woken up so early...ie Ww's morning school alarm at 545am & 6am, this morning it was Eliza crying in the other room at 5+am. I end up taking another long nap in the late morning when Eliza is asleep. Yesterday, i had to walk to the clinic to see my GP cos there was some swelling at my vein where the IV was. Thank God it was only some inflamation and i was given antibiotics & some cream for it. The swelling has subsided but my vein still feels like a rod in my flesh and feels bruised when i touch it. All my other blue-black (orr-cheh) has more or less started to fade off...my arms look like i've been beaten up...or probably got bitten by a vampire. Anyway...i was short of $4!!! and they don't have nets!! so i had to walk to the atm, draw money and walk back to the clinic. phews...it was a walk i didn't want to move. Couldn't believe how drained out after that when i got home. My GP said that i'll surely get tired cos i 'had a major operation, you know!'. 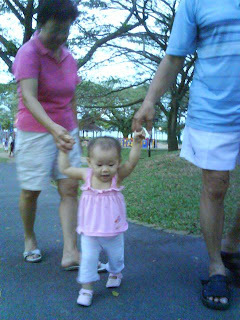 Eliza's a cutie pie, practicing her walking these days. carrying things up and messing the house up. Today, i find it easier to get up & out of bed...at least i don't feel so much that i'm gonna tear myself up. I'm finding my agility back! So i managed to put Eliza to sleep for her two afternoon naps. Though, the 1st nap, i was so tired & sleepy that i was drifting in and out of sleep while she pottererd around in her playpen. We juz changed our wok cos it seemed to be flaking at the base...so we got a new one free! 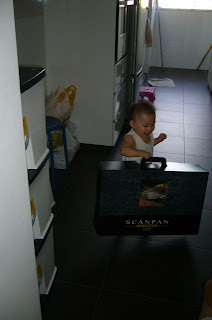 and while she can't really play with the wok, the box is hers. Big briefcase huh? made in christmas baby didn't make it. i had a ectopic pregnancy, which means that the fetus got stuck somewhere in the fallopian tube and ruptured. she was only less than 4weeks old. Anyway, i think the bleeding inside caused me to faint (low BP) on tuesday, was sent to A&E and an emergency operation to clear the blood clots and stop the bleeding inside and to remove my right fallopian tube, that i guess was part of the rupture. I wasn't really half-dead there anyway, juz unable to stand at all cos of the low BP. was quite alive and letting them poke me here and there, draw blood (always! ), answering lots of questions, and hoping there was some answer to my fainting (cos i really didn't know what on earth was happening to me), i didn't even realize that it could be much related to my pregnancy, though that was quite an important clue for their diagnosis. it was only closer to the op that the pain kinda started to come in if i breathed too hard, it felt as if my tummy could burst and the moving me here and there hurt. After everything, i realized how serious it was, the surgen was explaining to us stuff and said that at one point my BP dropped suddenly such that they had to have blood transfusion to 'save' me. Though many articles writes that this is fatal. In singapore, it's still quite ok...at least no one has died from it, as written in some journal, but it could be possible. This article gives a good overview of what it is. So I'm now recuperating at home, and was given 32days of MC. They say that the external wound heals in about a month, but it takes up to 4mths to for the inside muscles to heal. And someone was telling me that i'll have to wait another year to try for a baby (that long??). The biggest challenge of being at home is that i can't carry Eliza and do most day-to-day stuff like bathe her, carry her, change diapers (yet), and putting her to sleep (yet..because she moves around too much and i can't really catch up with her moving her abt). The most i could do is feed her and play with her. When she wants me to carry her i had to tell her mummy can't carry her up but i can hold her hand and we can walk together. Can't sleep with her in the same room either cos she'll want to sleep with me halfway thru in the night and she is quite rough when she sleeps. So in a way i've moved to her play room to sleep, with Ww as well, cos now my mil sleeps in our bedroom with Eliza at night. I'm getting better, and it gets easier to change positions now, ie from sitting to standing, from lying down to sitting up. The wound looks quite ok still, no splitting or any infections, even though yesterday i've been trying to control my laughing hard because of my hilarious hubby, Eliza's cute antics, and some lame show i watched last night. Sometimes i find it really hard to rest, because i feel ok. Took a walk to interchange today for breakfast and back, after that i was quite bished out, as if i've been drained out or something. Maybe this morning's activity was a bit too much. Quite cool, a nurse frm SGH called to check how i was doing. Anyway, i was telling her i had a swelling that feels like a bruise at where the IV was since yesterday. Weird thing was there was no bruise, the bruise was at my wrist and that part didn't hurt. She advised to go see a GP in case of infection. So this one i'll wait till tmr and see how it is..seems like the swelling is going down. Eliza enjoying making the bed with us. She also found much pleasure and fun putting on her hat. This morning at Cartel...when is the food coming?? i'm hungry! ~ She'll touch her ears, she'll touch her head on cue. but still doesn't 'touch her nose' or 'close her eyes' on cue...i've been trying to teach her that. maybe it's not so fun to do those? 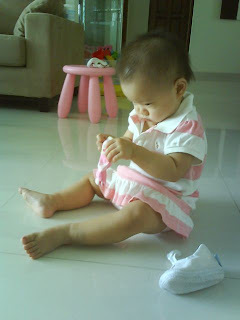 ~ She'll know that her socks and shoes go to her foot, and even attempt to wear them. 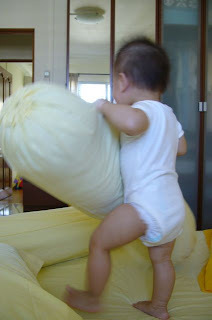 ~ She'll gleefully fall backwards from a sitting up position on the bed or sofa when changing diapers. ~ She'll shake her head sideways indicating no, especially when we offer her to finish her milk. 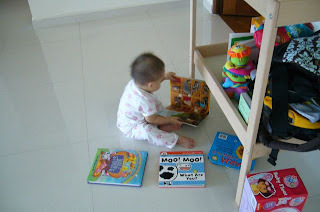 ~ She will happily kiss her stuffed toys, head touch them, hug them, sayang them, throw them or chew miffy's ears. But getting a kiss from her is like finding gold. She doesn't always do it to us. 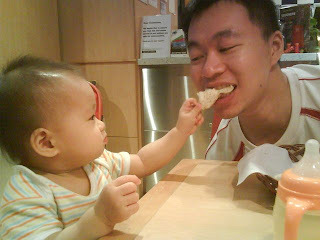 Though she does kiss daddy more than me...she hugs me more than daddy..ha... ok we balance out. 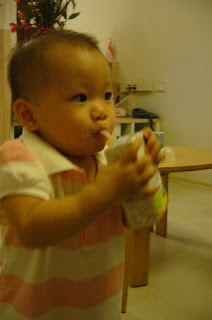 Eliza enjoying the packet of organic pear juice...i had to fight with her to finish it. I have bits of pieces of stuff i have forgotten to write previously, typed here in no particular order..or rather..which i remember first. Lots have bee happening lately and though Christmas was quite a quiet one where 3 of us hung around at home wondering where to head out to over the long weekend. (the thought of going to TM, again, terrified us...ok juz kidding..but we were just sick of that place). Ww's parents were in Hapchai so we were on our own. It's nice to have the place to ourselves once in a while, actually. ah-ha...i was excited about this, especially since Eliza is at the age of more exploration. I guess Eliza wasn't as excited as i was till she saw the gym. Gosh...it was like we seeing heaven or something. she was out of my grip once i stepped in and let her go. It was just pure fun. (makes me think that i should bring her to Fidgets one day. 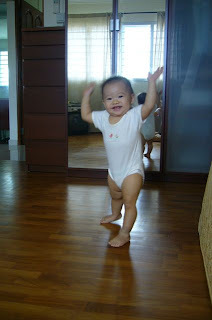 As she was just learning to walk, she joined the class that was more for babies from 6mths to 12+mths and non-walking babies. There was this sit together time where the babies had a welcome song, some warm ups and an action song...but Eliza was too distracted to join in. I was trying to get her to join in but with little success...and lots of energy used up. phews. She was going on from gym to gym equipments like an energizer rabbit. 15mins into the class i called ww to join us inside (cos it writes outside that only one parent to one child so Ww didn't join us initially). Anyway it was quite an exercise catching up with her. The BIG ball was her fav. it was almost as huge as her but she was adamant on carrying it up and walking with it. actually she almost rolled with the ball. some of the obstacle courses weren't too interesting for Eliza and she would head off to other directions within the course. they have those squeaky sounding toys to lure the babies to the end point, but alas it didn't work for Eliza. (eventually we realized the ball was a good lure for her). Maybe the babies there were quite young so they were quite docile, learning to roll around, and stay on their tummies, or exploring peacefully. No, not for Eliza, you just blink and she's gone off somewhere else...tumbling around. Occasionally she'll stop by a baby, take the baby's toy and give it back to the baby or give the baby a toy she's holding. To some extent, this experience made us wonder whether Eliza will sit still in a class environment...maybe without all the gym obstacles? Well...Fidgets will be good...for our fidgety baby. This is her after the trial, tired out...and thinking hard...maybe dreaming of the great time she had. 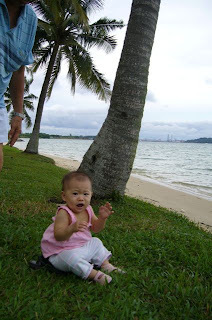 We finally made it to Pasir Ris park playground one saturday. And as usual, Eliza wasn't sleeping by 5pm and slept on our way there. Still she did wake up in time to play while the sky is still bright. 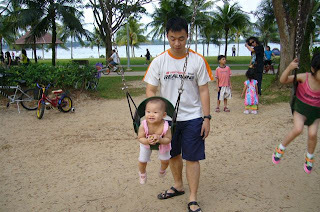 I wanted to let her try the swing, but it was quite a non-event for her actually. the swing was quite big for her so she had to lean forward and many kids + parents were eyeing the swing so we had to keep it short. hey why did u leave me here?? come here and get me out of here!! how come i can't get my foot in?? More on our Tumble tots experience next time...no photos...coz no photography allowed inside...geeezz. 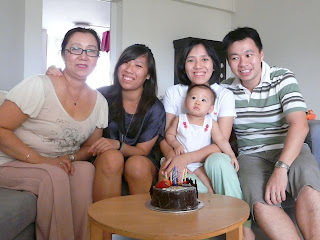 ~ my family. Thank God for Ww to share the joy of watching Eliza grow & helping in the babycare as much as he can. 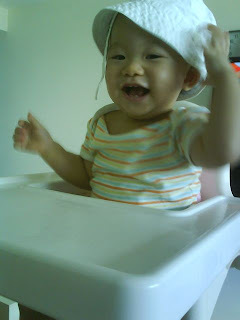 Even though in the initial months i was occasionally unhappy about him not doing enough, & also not being pro-active enough, we eventually figured out some things that he'll usually do (also on sundays..so we'll shorten our 'getting out of the house' time). Thank God for my mil, whom i almost cannot do without. She cooked & took care of Eliza during my confinement, and continued to take really good care of Eliza now. ~ my work. Thank God that my boss was very understanding and allowed me to take a 3-day work week so i can spend more time with Eliza. And it was his initiative. 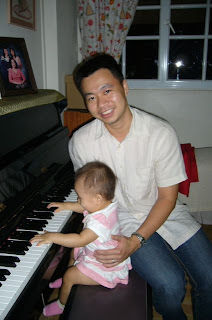 I thoroughly enjoyed the time i had with Eliza when she was younger and yet be able to work some days. ~ our finances. Thank God that despite lesser income, we could still survive. Most of our house installments were in the last installments this year and that gave us some extra cash. ~ Eliza's health. her initial month of prolonged slight jaundice was diagnosed as something like UTI but all is ok after some antibiotics. 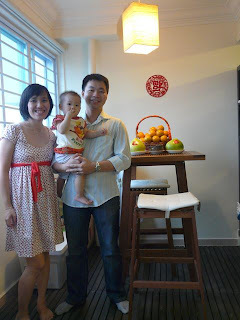 she had a bout of flu & flu from her 6-9mths that was tiring for all of us but she recovered from that and has been in the pink of health since. Looking forward, there are new challenges in this new year. I look forward a new year seeing my lil Eliza grow and discover herself. Then again , in the midst of the recession there's a high possibility of being retrenched in my company (they have retrenched 8 people so far..and more to come in January). We ask, can we do with one income if i do get retrenched? Or can i find a job? (not much good openings in my line though, unless i change line). As we try for baby no.2 (and God plans/gives), we prepare ourselves for another mega change in our life. Still, we'll be learning to let God open the doors, waiting for Him to provide and walking with Him. This is her usual morning activity, after her morning milk in the room. She'll pull all the books out...I wonder why she always manages to get the book upside down. 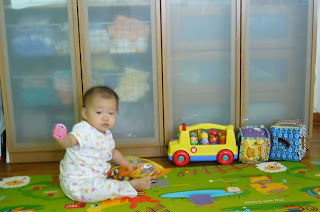 Ww & I were so sleepy after lunch so we lazed around in her playroom waiting for her to be sleepy so we can nap together. she doesn't look sleepy at all right? 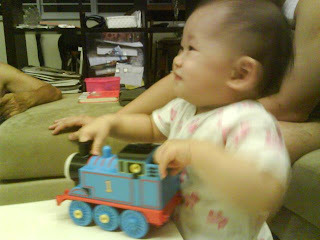 The thomas the train toy...she loves to poke her finger into the chimney, especially her pointer and thumb. Then she'll cry for help for us to save her finger. It's more difficult to 'plug' her thumb out cos it's more meaty. Still, she keeps doing it.